BUSRide spoke with Nick Ross, industry solutions manager for Intelligent Transportation Systems (ITS) at Trapeze Group, about “smart cities,” and the part technology plays in advancing this important concept. 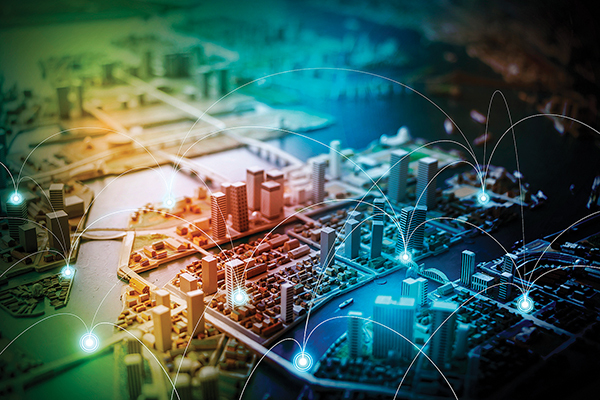 Connectivity is the name of the game within a smart city. Trapeze’s ITS enables an agency to connect and share important data points collected from the equipment within their various modes of transport – this could be with the use of AVL tracking, passenger counters, fare collection, signage, etc. Additionally, the available equipment on their roadsides (i.e. electronic signage, sensors, cameras) and even the phone in their rider’s pocket (trip planning, ridership apps) empowers an agency to consume and distribute this data in meaningful ways to better improve their safety, processes, and overall operations. Why is the “smart city” concept important? A “smart city” has connectivity which increases the flow of information. The improved collection and flow of accurate information is not only for agency operations, but it brings better insights on how to approach future improvements and ways to increase efficiency throughout that smart city. While you can use the connectivity of your systems to improve service and other key performance indicators, if that connection doesn’t flow back to key stakeholders (riders, city planners, etc.) then you aren’t operating a smart city to its utmost potential, or even at all. The whole concept is supposed to provide a platform for open communication so that operations can function in the most optimal and easy-to-use fashion. Connectivity could also mean how a city’s infrastructure is built. Are your schools, business, and restaurants easily connected to a transit stop? Or is there one nearby? In high-density areas, like Shanghai, businesses won’t move into an area unless there is a transit stop nearby. Therefore, the closer to a smart city you are, the more dependent residents are on city infrastructure and public services (like transit) to get to the places they need to go. Why is the “smart transit” concept important? As mentioned above, residents of a smart city are more dependent on essential services. Because of that, a “smart city” cannot exist without “smart transit.” People need a means to get to and from places as effectively as possible. And we know the consumer car is NOT the long-term, viable answer. So how can we make taking transit seem easier than the personal car? This is exactly where smart transit comes into play. We’ve been talking a lot about connectivity and the flow of information, but the more an agency’s operations talk and work together, the better insight you will have to provide better service for your riders. So, let’s say a vehicle has an unexpected maintenance issue and breaks down on the side of the road. If your systems are integrated, then, in real-time, the bus stop signage updates, the website updates, your IVR system updates, your app updates, and so on. At the core of it, this scenario is exactly what constitutes the concept of smart transit. What role does “Big Data” play in both smart transit and smart cities, and in your own offerings? Collection of data is easy, but how you process that data and make it consumable for multiple purposes, now that’s the difficult part. But thankfully, in the transportation industry, whenever there’s a problem, people step up and work to solve those problems. Big data creates a better understanding of how your ridership uses your system, improves maintenance processes and schedules, and tracks patterns you may have never known existed. With that, whether it’s “big data,” “smart transit,” or “smart cities,” or all of the above, the industry has seen just the beginning of a technological boom of new solutions and even new companies ready to take on that challenge, and we’re no different. How do you foresee your technology working within a smart city in five years? Ten years? Predicting the future is hard – especially with the exponential rate at which technology is evolving. That said, the focus will always be toward a fully-integrated system that provides passengers, agencies, cities, planners, or any other stakeholder of a smart city with information and tools to make intelligent decisions.